It has incestuous, pig-breeding, drunken Irishmen, snooty Frenchmen, farcical Jewish anarchists and the animated presence of a mad mullah ranting about how women must be subservient to men. It reminded the Daily Telegraph of the Carry On films and the London Evening Standard of the slick, cruel, abusive style that Bernard Manning perfected ages ago. 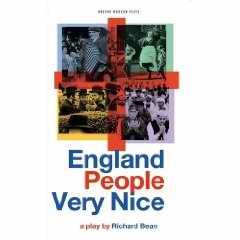 Its director and writer may well have anticipated controversy, but shortly after opening at the National Theatre, England People Very Nice , a new play by the award-winning dramatist Richard Bean about successive waves of immigration to the east end of London, has been labelled racist and offensive by the communities it portrays. A delegation of writers and community activists from the East End will meet on Friday with Nicholas Hytner, the National's director who is also directing the play, to protest against what they regard as a caricature of Britain's racial history. The National represents modern Britain, and in particular London, and I don't see how Muslims can identify with the National Theatre when it puts on this kind of racist work, Hussain Ismail, a playwright from Bethnal Green who has demanded the meeting with Hytner, told the Guardian: I have been going to the National for 20 years, but I don't see how I can identify with a place that stages what I see as a personal attack on me and the community I belong to. Hytner said in a statement: The play lampoons all forms of stereotyping: it is a boisterous satire of stereotypes of French, Irish, Jews, Bangladeshis, white East End cockneys, Hampstead liberals and many others. Every stereotype is placed in the context of its opposite and it clearly sets out to demonstrate that all forms of racism are equally ridiculous. Bean's comedy, set around the Brick Lane area of east London, spans more than three centuries, from the arrival of Huguenot weavers to successive influxes of Irish, eastern European Jews and Bangladeshi Muslims. Each wave is greeted with hostility and suspicion with locals, only to integrate to such an extent that they themselves take a similar attitude to the next wave of newcomers. Artists from the East End will be holding a protest outside the National Theatre at 5pm on Friday 27th February in the run up to the platform discussion at 6pm with Richard Bean, the writer of the play. Playwright Hussain Ismail, who will be leading the campaign, said: Hytner is scared of a debate. We are from the East End and we know that it is the most multicultural place in the world. Brick Lane in particular is the centre of the multicultural universe. It's the coolest place on the earth and that's why people come from all over the world to hang out there. Bean and Hytner haven't got a clue about the East End. That's why the play is bonkers! We want a right of reply ­ a proper debate ­ not a 40 minute platform discussion where the director just asks some bland questions to the writer and we all go home. We want a vigorous and robust debate with Bean and Hytner and us on the same platform with the media and public present on mass. Organisers of the protest are asking everybody to come celebrate multicultural London and demand that East End artists have the right to a debate, and challenge misrepresentation of their communities. They are asking protesters to bring whistles and drums to stand up for multiculturalism. A demonstration against the play England People Very Nice was held outside the National Theatre. The play by Richard Bean looks at immigration in London's East End. It is directed by the National's artistic director Nicholas Hytner who says that the play lampoons all forms of stereotyping: it is a boisterous satire of stereotypes of French, Irish, Jews, Bangladeshis, white East End cockneys, Hampstead liberals and many others. Every stereotype is placed in the context of its opposite and it clearly sets out to demonstrate that all forms of racism are equally ridiculous. The outdoor demonstration preceded a Platform event during which the play's writer Richard Bean was due to discuss his work. 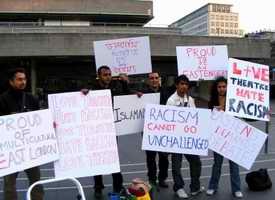 The protest, under the banner 'Love Theatre Hate Racism', was organised by Bethnal Green playwright Hussain Ismail. Cllr Abjol Miah, leader of the Respect group on Tower Hamlets Council, was present with several objectors from the East End. I am passionate about theatre and I don't think theatre should be used to peddle racist filth under the guise of comedy and serious theatre. Hussain Ismail told the small crowd of passers-by on the riverside who stopped to listen to speeches. The National Theatre is staging two debates about the play in April. The National Theatre has been warned it faces further protests from anti-racism campaigners if it continues to show England People Very Nice by Richard Bean. Campaigners have already disrupted one talk before a performance of Richard Bean's play, England People Very Nice, by mounting the first onstage demonstration in the National Theatre's 32-year history. Last Friday, two protesters clambered on to the stage at the National's Olivier Theatre and condemned Bean as racist. For 10 minutes, playwright Hussain Ismail and teacher Keith Kinsella interrupted a talk that Bean was giving prior to a performance of the play, before being ejected by security guards. Bean's play charts the settling of the French Huguenot, Irish, Jewish and Bengali communities in Bethnal Green since the 17th century. The National has billed it as a riotous journey through four waves of immigration in the East End of London. But the protesters have failed to find anything humorous about its themes. After his protest smail said: Richard Bean is making it seem like all Bangladeshis are drug dealers or users, muggers and marry their cousins. Kinsella said: I find it outrageous that a play that could have been written by a racist Year Nine pupil has been allowed to be performed at the National – a publicly funded theatre. Ismail outlined his plan to take the protest to currency exchange firm Travelex, which sponsors the National's £10 ticket season. He said: I've asked Travelex to support and mediate our claim for a public debate. If they don't come back we will have to say that Travelex supports a racist play. The protest has been planned for March 21 outside Travelex's London head office in Kingsway, he said. He also hinted that audiences could be picketed, but would not reveal exactly what form the action would take. Ironically the play was meant to lampoon the sort of racist 'Alf Garnett' attitudes that all the four immigrant groups have experienced. Nicholas Hytner, the director of the National Theatre, said: The play lampoons all forms of stereotyping. Every stereotype is placed in the context of its opposite and it clearly sets out to demonstrate that all forms of racism are equally ridiculous.